The US stock market is happening to be in another correction – second this year. The market has already dropped more than 10% from its highs. However, it is still 5% up year over last year. The stock market’s infirmity started at the beginning of October when major indices failed to break out above the resistance of highest high. Dow Jones was the only one that managed to close above its highest high although for one day only. A decrease of entire market was accelerated by decrease of many large caps – companies such as Google, Amazon, Facebook or Netflix are trading below their 200 Moving Averages. When the entire market is experiencing such obvious correction, many analysts and fancy financial market participants are predicting the bottom and then, of course, the gains are supposed to follow, especially when the market gaps up. A fact is that nobody can predict when this is happening because nobody can see in the FUTURE. All predictions about the bottom in terms of price on Y – axis and time on X – axis are FAKE. Instead of a weekly market review, I have decided to pay full attention to current correction this week and thus, I am not going to elaborate each index separately as I usually do. The correction setup is approximately same across all major US indexes and hence, if you’re interested you can take below analyses and try yourself with the other index charts. 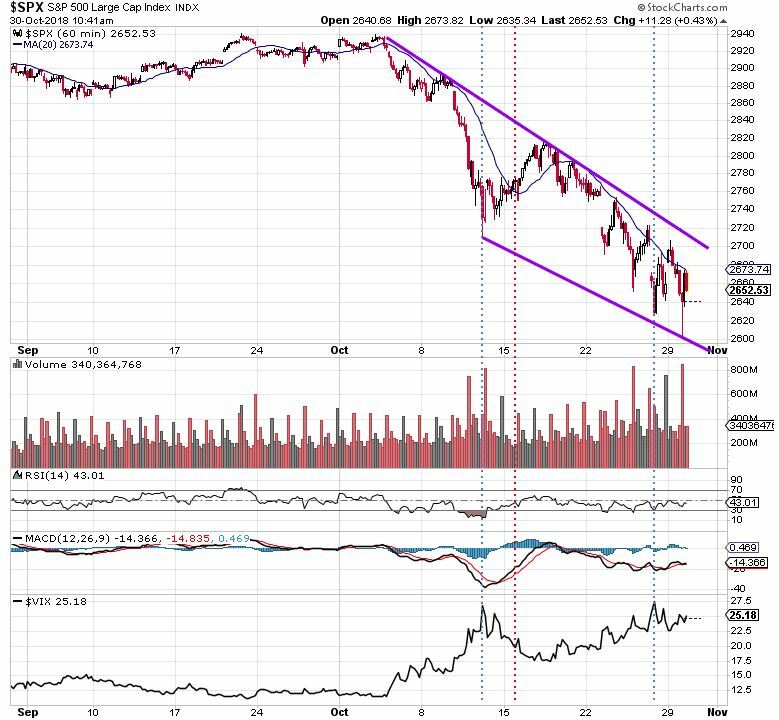 The S&P 500 below is displayed in an hourly interval to show a clearer picture of current downtrend. Since the correction started the price has developed a bearish channel with obvious support and resistance levels. We are seeing a great example of lower lows and lower highs. Do you enjoy what you’re reading? Subscribe to new articles here! Price goes steadily and gradually upwards and thus, the volatility would go steadily and gradually downwards. Price goes quickly up in a V-shape of recovery and thus, the volatility would significantly increase (above 30 – ideally around 40). Look at the VIX (fear index – most accepted measure of volatility), it is nor gradually decreasing nor significantly increasing. It is moving in the increased levels compared to previous trading periods between 17.5 and 27.5. It is increased and it is fluctuating – there are obviously important market values still being corrected. The blue dashed lines depict the VIX at its highest levels during this correction and as you can see the prices is still going down with NO BOTTOM. The important economic indicators must clearly prove the action of the price. RSI did not survive above the 50 for too long and MACD line barely managed into a positive territory. These indicators must support the price action as it is defined. To see an existing bottom, I would expect RSI reaching between 65-70 at least and MACD stay in positive values. So far – NO BOTTOM. At the first sight the correction seems to be shaping in a bearish trend channel depicted by two parallel trend lines. However, if you check all the details, this price movement is actually flashing first signs of Falling Wedge Pattern. If it proves to be falling wedge, you are going to have the great opportunities to trade this setup with very favorable profit prospect. Watch Out! I do not know when the bottom is happening and you do not get fooled by those who are trying to predict this “fabulous” future. What I know is that we are still in correction and once the bottom happens, then we all are going to recognize it based on proven fundamental and technical trend following principles. Pingback: Real Market Rally or Christmas Fling?